Mtembu Lodge is steeped in conservational history, Zulu culture and represents our commitment to unique, luxurious hospitality offerings in partnership with local Zulu communities. We look forward to welcoming you to experience this with us. Mthembu Lodge has an earthy character, just as luxurious as sister lodge, Biyela. Situated higher off the river, it has a panoramic view of the waters and the forest.Chosen for sentiment and soul - the spot where Mthembu Lodge stands is the exact place where Dr Ian Player stabled his horses which were used on patrols and wilderness leadership training in this area. Visitors can immerse themselves in the story of how Dr Player started what would become a global effort to save the rhino from extinction. Private Concession adjoining Hluhluwe Imfolozi Park. Central Lounge area with rim flow Pool. Views onto the White Imfolozi River. Private Safari experience within uMfolozi Big 5 Reserve. Mthembu Lodge serves wholesome and light meals. Spreads of fresh, locally produced vegetable dishes. Guests enjoy authentic African and International cusine based on simple needs and recipes to enhance the flavours of local ingredients. 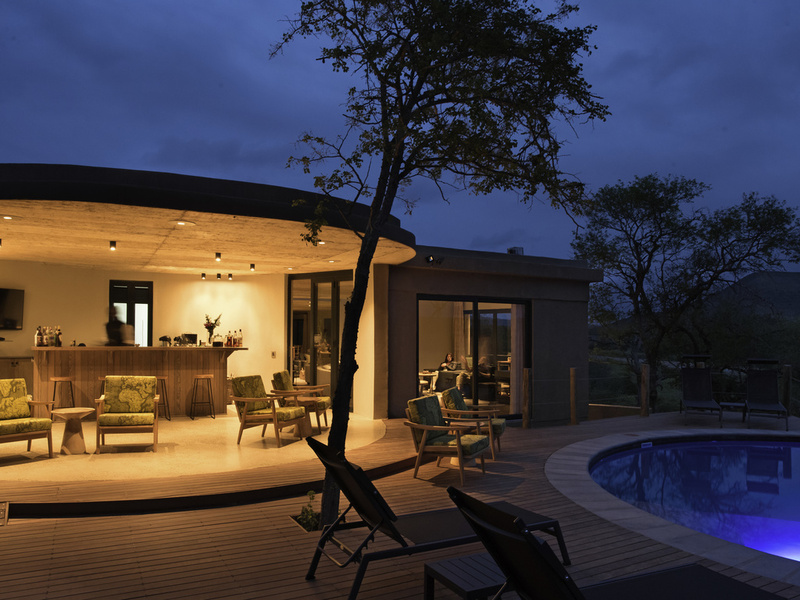 Mthembu Bar sits nestled between the relaxation area of the Main Lodge and the outdoor plunge pool. With great views from the intimate Bar area and swimming pool a refreshing drink can be enjoyed with the evening sun setting over the Reserve.